Maybe this has happened to you. The weather is perfect, your family and friends are ready to go, the key is in the ignition and when you turn it to start the engine(s) nothing happens. Sound familiar? Well, you’re not alone. You may be a victim of dead batteries that all too often result from poor battery maintenance. This can also happen to your generator battery, even your tender or jet ski battery. A dead battery, or one with low voltage, can even affect some of your electrical components from operating correctly. It is with this in mind that I have put together a short article on the care and maintenance of marine batteries. I hope that it will help you better understand how to prolong battery life so you can better enjoy your boating experience rather than deal with unexpected down-time. Virtually all of the maintenance illustrated below can be performed by the average boat owner or captain with basic mechanical skills and tools. However, InterMarine offers dockside service and maintenance as needed. If you need help or have a question, call our service department at (954) 894-9895. There are two types of marine batteries available for recreational boats; wet (lead acid) and dry (gel). Wet batteries have been around for a long time. They’re efficient, long-lasting and, with proper maintenance, will serve the boat well for 24 to 36 months, even in South Florida’s tropical environment. Dry (Gel) batteries are newer to the market and require limited maintenance primarily keeping the connections and casing clean. Batteries to a boat are like the heart to a human being. Not much on a boat can function well without adequate 12 VDC power. To this effect, all batteries need good and regular maintenance to achieve maximum performance and long life regardless of type, wet batteries or dry. The good news is battery maintenance is easy. A clean battery is a happy battery. Wet (lead acid) batteries may at times splatter liquid (distilled water/acid) which can cause the battery to discharge faster than normal. The best way to clean a battery is with a mixture of fresh water and baking soda. This mixture will neutralize the effects of the acid. It is also important to check for corrosion at the battery terminal posts and cable ends. I recommend doing this once every four to six months. Also it’s a good idea to check for any greenish residue that indicates that corrosion has, or is setting in. To clean the battery posts and terminals simply disconnect the terminals and clean them with a wire brush or battery terminal cleaner (available at marine or automotive supply stores). After cleaning apply a thin layer of petroleum jelly to the terminals then reconnect the cables to the appropriate posts – Black to Negative, Red to Positive. Make sure the terminals are clean and tight and you are done. 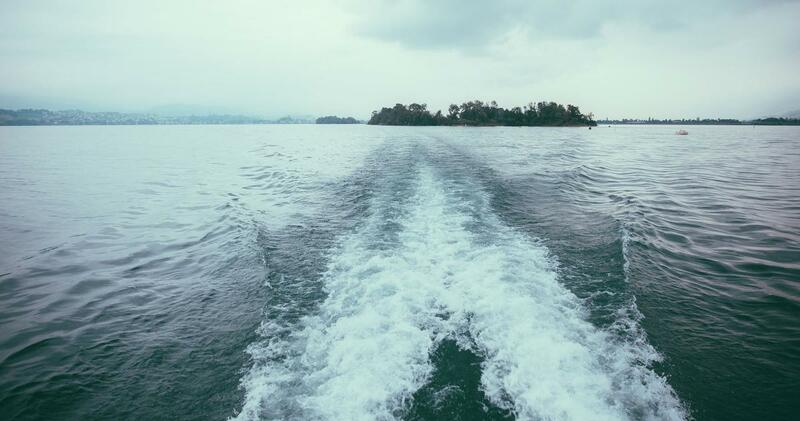 IMPORTANT NOTE: For newer boats or boats with complex electrical systems, sensors, joystick etc., it is recommended that an alternate source of 12 Voltage power be connected to the boat electrical system BEFORE disconnecting the battery terminal(s) for maintenance. The best way to do this is to connect a fully charged battery jumper pac (in ON position) to the terminals/battery POS and NEG clamps leading to the boat electrical system in such a manner as to provide constant source of DC power to the boat when you disconnect the battery. For wet batteries you should check the level of the electrolyte in each cell. If the level is low then you need to add liquid. Top off (1/4 inch below top) using distilled or de-ionized water ONLY. Adding anything other than pure distilled water to the electrolyte will introduce impurities into the battery (such as chlorine and fluoride) that can cause adverse chemical reactions inside the battery and shorten its life span. I suggest the battery fluid should be checked every two to four weeks in South Florida depending on several factors, which include weather (heat/cold) and whether or not the batteries are on a constant charge. Batteries on trickle or constant charge should be checked more often as the distilled water tends to evaporate faster. A good way to add distilled water is with a small plastic funnel. Using a flashlight will help you get a better view of the level inside each cell and prevent you from overfilling it. Sealed batteries (dry) gel or AGM batteries do not require this. Older batteries tend to lose their charge at a faster rate than newer batteries. The typical life of a marine battery is two years. When you replace a battery it’s important the new battery(s) is of good quality and appropriate size and type. Using sub-standard batteries may be less expensive at the time of purchase but can cost you much more in the long-run. While most of what I have touched on is relatively easy for those with basic mechanical skills, replacing batteries, can be difficult due to their heavy weight and placement. But don’t fret. All you have to do is call InterMarine service and they will do the heavy work for you. It’s important to maintain good service records your batteries and for your boat. With good records and documentation you can avert the inconvenience of poor or dead batteries by knowing when it’s time to replace them. Here’s a handy checklist I developed to assist with your battery service or replacement. ___ Check terminals and connections for tight connections. Tighten as needed. ___ Clean with wire brush/terminal cleaner then apply light coat of petroleum jelly as needed. ___ Check fluid levels (wet batteries only). Add pure distilled water as needed. ___ Clean and dry battery and area around battery. ___ Log date when battery was checked and/or serviced and what was done. Following these tips will result in more fun on the water with less down time. Don't forget to schedule your boat maintenance! Call our service department at (954) 894-9895. You can also use our service contact form to request a callback.